Take in all of the natural beauty and romance of the countryside surrounding Grand Traverse Bay with a peaceful hot air balloon excursion at Traverse City Balloons. Located in Traverse City in Northern Michigan, we have been providing awe-inspiring experiences for locals or visitors from Detroit, Milwaukee, or Chicago for over 30 years! Reservations are required and often you can fly the same day you call. 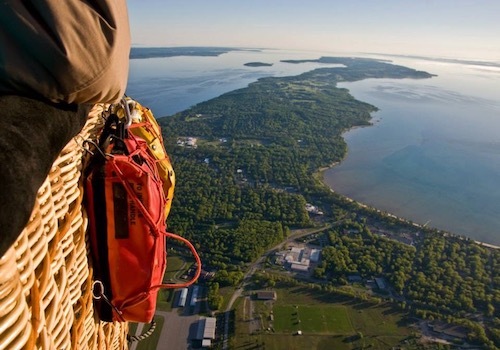 Take in the beauty of Grand Traverse Bay from up in the clouds with a magical hot air balloon ride with Traverse City Balloon Tours. Explore the natural wonders of Lake Michigan, admiring vineyards, cherry blossoms, and picturesque views of the bay that have come to define the area. 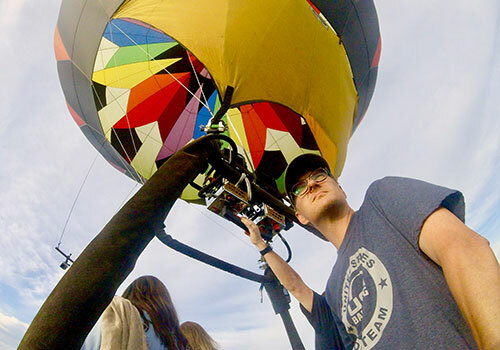 Whether you are a tourist from downstate or a Michigan local, Traverse City Balloon Tours can show you an unseen side of the Grand Traverse Bay with a hot air balloon ride. Explore Grand Traverse Bay with a collection of other interesting individuals. We offer shared hot air balloon rides at either sunrise or sunset. Treat yourself to a 360-degree view of the natural beauty of the Michigan shore. Take to the sky with somebody you love with a private hot air balloon tour around Grand Traverse Bay in Michigan. Whether you are a tourist or a local, we offer affordable packages on either a private sunrise or sunset flight. Make your next event special with a tethered hot air balloon ride. No matter what you are celebrating, a tethered hot air balloon ride from Traverse City Balloon Tours will make it a day your guests will never forget. Call for more details. Give your loved one the gift of an unforgettable adventure with a gift card to Traverse City Balloon Tours. Give a gift that will be sure to make an impression, allowing someone you care about to become fully immersed in the awe-inspiring beauty of Grand Traverse Bay while floating through the heavens on a hot air balloon. Simply click on the link below to purchase a gift card for a private or group hot air balloon tour from Traverse City Balloon Tours. After you click Purchase Gift Card, click Book Now button for the preferred flight to see Buy Gift Card option on the right. Our Chief Pilot, Jeff, has been ballooning since 1978. At four years old his parents took him for his first ride and that sparked a lifelong passion. In 1993 he received his license, and two years later in 1995 he began flying rides and corporate balloons. Since then, he has flown over 5,000 times in 6 different countries on four continents, including the savannah of Tanzania, the rainforests of Costa Rica, the rice paddies of Japan, and the outback of Australia. When Jeff isn't flying passenger rides in Michigan he enjoys competitive hot air ballooning. He attends the US National Hot Air Balloon Championship each year and is currently ranked 7th in the nation. Rest assured, when you fly with TC Balloon Tours, you fly with one of the best! Prepare to be in awe as an experienced and licensed hot air balloon pilot takes you on a delightful flight around Grand Traverse Bay. Traverse City Balloon Tours offers 2 different flights, allowing you to either begin your day bathed in the peaceful serenity of a dawn sunrise or witness the majesty of the sun setting over the bay. Embark on a journey in a 4 passenger small basket or a 10 person large basket, and prepare to be amazed as your balloon takes off on an unforgettable adventure.